Egyptian national Eman Ahmed, who was until recently believed to be the world’s heaviest woman, will be discharged on Thursday from the Saifee Hospital in Mumbai, where she underwent treatment for severe obesity. “Eman, who was brought here in February this year, weighed around 498 kg on arrival. Her weight has reduced to 177 kg,” Dr Muffazal Lakdawala, bariatric surgeon who led the team of doctors treating Eman at the city hospital, said on Wednesday. “Huzefa Shehabi, COO Saifee Hospital, has received an e-mail communication from VPS Burjeel Hospital (in Abu Dhabi, UAE) saying that Eman is ‘stable, in good health and fit to fly’. She would be discharged from Saifee tomorrow (on Thursday) at 10.30 am,” said Lakdawala. A doctors’ team from Saifee will brief the team from VPS Burjeel (a hospital initially introduced to Eman’s family by Dr Lakdawala) about Eman’s current medical status, he said. “We are extremely happy and pleased with her progress and wish her all the best,” added Lakdawala. A team of doctors from VPS Burjeel had visited the patient in Mumbai on April 26. 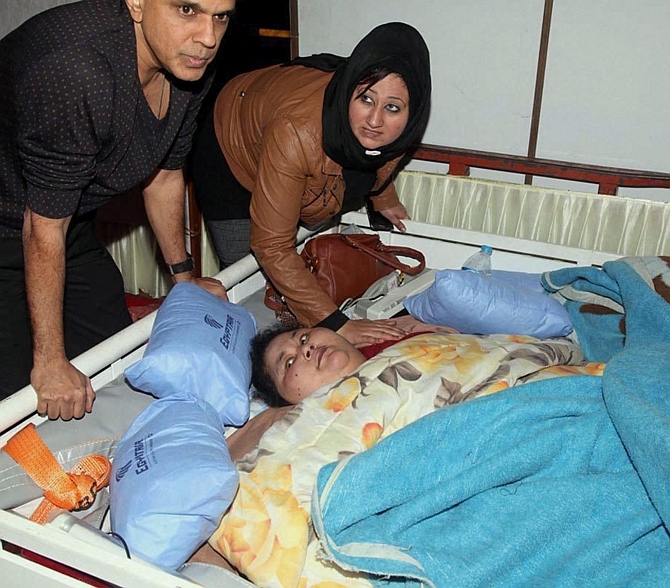 Eman, 36, who was accompanied by her sister Shaimaa Salem, would be shifted to VPS Burjeel Hospital for further treatment. The development came last week amid allegations by Shaimaa that Eman was not receiving proper treatment at the privately-owned Saifee hospital in South Mumbai. According to Saifee authorities, the total cost incurred on Eman’s treatment was around Rs 3 crore, of which the hospital received Rs 65 lakh in the form of donations from Indians. “We have not asked for a single penny from Eman’s family. We are happy that we did bring her weight down,” Lakdawala said. Eman’s sister, in an online video had recently alleged that the doctors at Saifee, made ‘false claims’ about Eman’s complete recovery and weight loss of 262 kg. Refuting the allegations, Dr Aparna Bhaskar, section chief of bariatric surgery at Saifee Hospital, had said that Shaimaa may be criticising the doctors to extend her sister’s stay at the hospital. Dr Lakdawala too had denied the charge. Saifee authorities had on April 27 filed a written complaint against Shaimaa at VP Road police station for obstructing the medical treatment of Eman. The hospital had alleged that Shaimaa tried to put water in Eman’s mouth, despite being told that she must be fed by tube only. Eman underwent bariatric surgery in March in which doctors reduced her stomach size by two-third, so as to reduce her food intake. Her genetic tests had showed that she has a rare gene mutation that cannot be cured through surgery. Eman has been treated by Dr Lakdawala and a team of around 15 doctors from various disciplines since she was brought here from Alexandria on February 11 this year.